I'm posting 3 of the images i took this morning of my son riding around the back yard, nothing spectacular, but it was either him or some dull object, so i chose him! I took into account everyones comments on my lack of crisp images and I adjusted the shutter speed so that I got a clearer crisper shot, well i think its crisper! I love them as they're of my son but obviously room for improvement! Thanks for looking, feedback welcomed! Looking good - thats a nice tidy compact lens. Certainly looks like there is no motion blur and at 1/1000s there will certainly not be. The only sharpness killer here is the web downsize. Do you progressively sharpen you web images? Hi, no i don't tend to sharpen my web images, haven't really thought about it too much, i find in general most if not all of the images i post are softened a bit by the downsizing, but on screen it is pretty sharp. But yeah no motion blur this time around! I am really enjoying fiddling with this lens, still wish i had a Nikkor though....in due time! Glad to see that you are enjoying this new lens. It is not a Nikkor but it is pretty sharp and will give you plenty of great images until that Nikkor arrives! I agree. It always makes a difference and can make a big difference. You have to read up on how to do it so you don't push it too far with haloes and sharpening artifacts. i have never heard that about raw images needing to be sharpened, but i think i might look at doing that! I always shoot raw so that if i need to edit i have total freedom to edit it. So looks like i will begin to sharpen some images from now on! but overall i love this new lens, for the price i paid for it i am stoked! (ebay $295) like new.....so it was worth it. saved a few bucks! I found the images had good contrast, and the bokeh is not bad i must say! overall i can recommend the lens. The RAW image is just that. It contains the data from the sensor intact without ANY of the camera settings applied. The file also includes the information about the camera settings, & if you are using NX2, it applies them by default, but you can change tham however you like after the fact. If you are using some other RAW processor (e.g. Photoshop RAW) then the settings may or may not be applied as the camera intended them to be. 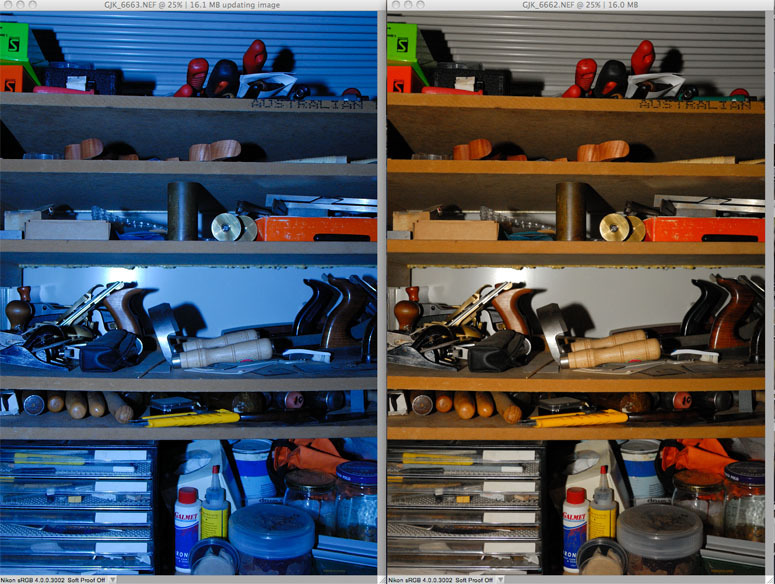 With photoshop, I tend to use no in camera sharpening, then apply an Unsharp mask in CS3. To resize for web, I sharpen slightly, then shrink to about 1600, then resharpen, then shrink to 775, then sharpen again. This seems to give a better result than just sharpening all the way then shrinking. Or for that matter, shrinking all the way, then sharpening. These days, I tend to use Aperture but I haven't worked out how to get the sharpening right yet, os I usually go through CS3 to post here, just for the sharpening. A real PITA as my CS3 is Windows but I use a Mac now & I often forget. NB, although the FAQ says to resize to 800, You actually have to resize below that or the forum will resize for you, and not do a very good job of it. Hence, 775. Have a look at the third image in this thread, then click through to the original to see the problem. bigsarg7, regarding the sharpening, I am ot sure what software you use, but I would suggest looking at your workflow, most software will allow you to generate scripts or batch processes, these are very handy for doing those things like sharpening and resizing, both things that just about all images need. For example I have a batch that progressively sharpens an image (or images) and resizes for use on the web. I opened up a raw image and went to camera settings, where 'Picture Control' is unchecked, the image looks flat and normal as a raw should, I the checked the 'Picture Control' and selected vivid. this made the image...well vivid i guess . So I am I missing something here or is it the case that the raw file when opened in CNX2 is a pure unadulterated raw file with no settings applied? This is the way I would assume it should be. bigsarg7, sorry for teh off topic nature of the last bit! I was under the impression the NX2 and DPP will display the RAW file with the picture style that was set by the camera. LR and PS won't because they don't read that part of the metadata, although LR and CR have the camera profiles in the software which will give you the same result, providing you haven't modified the picture style at all. Two photos taken, one with flash. One with WB=Flash, one with WB=Tungsten. I did nothing but transfer, then open in CNX2. Guess which one had the correct WB! I tend not to change the settings like "Vivid", but I do change WB & so I have noticed this as I often forget to change the WB to suit. i don't mind at all, i am trying to learn!! lol so feel free to continue!! By the way I use lightroom and cs5, both purchased about 2 months ago, so i still have a lot to learn as I only ever had cs2 and a lot has changed since that version! So please continue discussing it. definitely reads the data for white balance, which makes sense, however not the picture control info, thats what I see anyway.